This is the Nordic Catholic Church’s parish in Bergen, dedicated to St Sunniva. I have found the photo in their blog post Fastelavn og karneval. 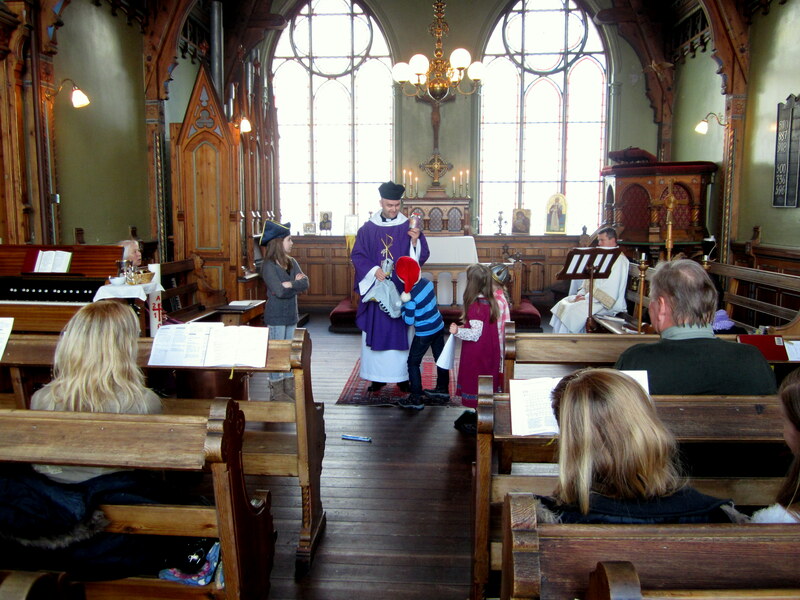 The priest here, Fr Roy Olav, is giving a lesson to the children about Carneval, literally “goodbye to meat” as we go into Lent. The object on the floor is a bar of chocolate lying there as a temptation. Indeed, Lent is about fasting and prayer, the only way to expel demons and sin. The western Churches have indeed grown very slack about fasting, which doesn’t mean doing without a few luxuries – but abstaining from all food for a given time. This should not be attempted by people in poor health, but I think most of us can decide to fast completely on Wednesdays and Fridays from everything except water until 3pm, the traditional hour at which Christ expired on the Cross. If this is done prayerfully and without ostentation, I think we can be surprised at the spiritual power of fasting. This church is quite surprising. The first thing that strikes us is the size of the windows. Coming from the north of England, I remember the short January days when I went to school on the bus, how the daylight hours were so short. The winter days in Norway are much shorter than that, and above the Arctic Circle, the sun is not seen at all for six long months! If a place is a little to the south of the Arctic Circle, the solar day may only last a few minutes or an hour! Those big windows are really needed. The building appears to be from the late nineteenth century with a fairly “low-church” altar similar to pre-Tractarian English ones. The altar rail wraps around tightly, and certainly makes high ceremonies difficult. Perhaps it lifts away for those occasions. The pulpit is imposing and the little pipe organ on the left in its neo-gothic case looks interesting. I would guess the organ needs work, since a harmonium is seen at the left of the photo. This building is obviously a former Lutheran church, which means that the Nordic Catholic Church was able to keep or acquire some of the old churches. That is something tremendous. This entry was posted in Uncategorized and tagged Independent / Old Catholicism, Nordic Catholic Church, Northern Catholicism, Union of Scranton. Bookmark the permalink. It is the chapel of what is, or was, the “Seamen’s Home” (or Seamen’s Mission”) in Bergen. I have been there; it looks like a late 19th-Century building. This is not St Sunniva’s chapel. This is Sta Sunniva Kapell. Divine Service used to be read at (and I mean at) the altar in the Church of Norway with only the sermon delivered away from altar, so there was little need for a lot of room around the altar, just enough room for the Priest, and perhaps an assistant clergyman to administer communion. The Dano-Norwegian Church Order of 1539 was modified in 1685 and remained in use until very recently. It is typical Bugenhagen being modelled on the Formula Missae of Luther, but from 1685 the service was entirely in the vernacular (well, Riksmal!) The Norwegians in the USA hung on to the 1685 Order with great determination, and the (Norwegian) Evangelical Lutheran Synod’s hymn still has an English translation of the 1685 Order as its second form after the 1888 Common Service, which is of Saxon origins. In cathedrals, for functions such as the consecration of Bishops, the ceremonial was conducted outside of the rails. The 1685 prescribes (for Norway, but not Denmark, IIRC) the elevations of the Host and of the Chalice at the Words of Institution, but the practice had disappeared in norway by 1814. I wonder if anybody knows when. The late Prof. Bodo Nischan once told me that the last German Landeskirche to abolish the elevations (as well as proscribing the making of the Sign of the Cross over them at the same time, immediately before the elevations) was Schleswig-Holstein, and that only in 1797. I have paged through the 1797 S-H Kirchenagende and the prayers in it reek for the most part of Enlightenment religious sensibility.